Casio are developing a digital camera that can capture an incredible 60 still images per second at full resolution, and 300 frames in movie mode! Unveiled as a prototype at the IFA trade show in Berlin, Germany, the 12x zoom Casio camera uses a new high speed 6 megapixel CMOS sensor and LSI image processing chip to achieve those amazing speeds. Other features offered by the high speed Casio include a sensor-shift image stabilization system, 2.8 inch widescreen TFT colour LCD, and electronic viewfinder. The precise product release date, pricing, brand name and specifications are still to be finalised. 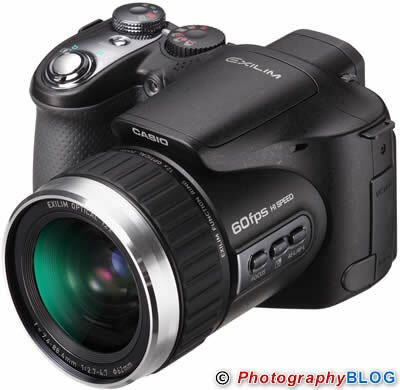 LONDON UK, August 31st, 2007 – Casio Computer Co., Ltd., announced today that it is developingan entirely new digital camera with hitherto unseen high speed performance and image capture functions that make the most of its cutting-edge digital technologies. This revolutionary camera of the future will be able to take still images at an astonishing shooting speed, to catch fast-moving subjects at the crucial moment. It will also take movies that capture movement so fast that it cannot even be seen by the human eye. The first prototype will be on display at the IFA, a consumer electronics trade show, in Berlin, Germany, which opens on August 31, 2007. Casio’s digital cameras have been setting the pace since 1995, when the company introduced the QV-10, a digital camera for personal use with an LCD display that played a major role in creating the digital camera market. 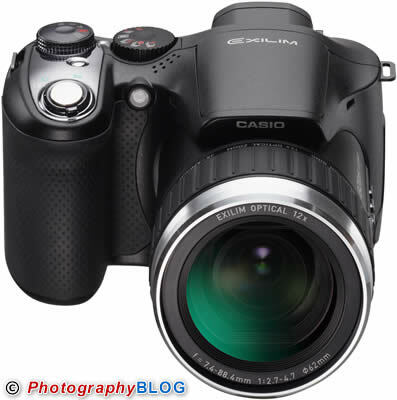 In 2002, Casio commenced sales of the card-sized EXILIM®series of LCD digital cameras, which feature superb portability and response speeds. 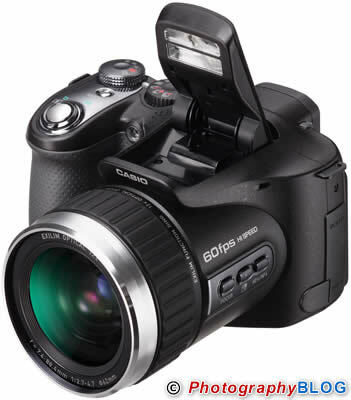 Casio is constantly seeking to expand the market by delivering greater ease of use and the kind of innovative functions that only digital cameras can offer. The prototype of Casio’s latest revolutionary camera features a new high speed CMOS sensor and a high speed LSI image processing chip. This 6.0 megapixel, 12x opticalzoom, high performance digital camera prototype with CMOS-shift image stabilization function offers not only ultra high speed burst shooting for still images, but also high speed movie recording. For still images, the camera achieves ultra high speed burst shooting of 60 images per second at maximum resolution —the fastest in the world*. Moreover, using Pre-shot Burst Mode, (a ultra-high speed continuous shooting mode that captures images from the scene prior to the moment when you actually press the shutter button), users can be confident they will never miss the most crucial photographic moment. Casio and EXILIM are a registered trademarks of Casio Computer Co., Ltd.Any other company or product names are registered trademarks or trademarks of those companies.